I’m here to tell you that all those reviewers that didn’t like the movie, or thought it was rehashed from the original are out of their minds. Monsters University was excellent. So much fun, such a great story, and so exciting to see these characters that we fell in love with back in 2001 all over again. I suppose we should start with the animation. I’ll go (not too far) out on a limb and say that Pixar’s animation is unrivaled in their industry. Sure Dreamworks does a good job with their animation, but Pixar is leaps and bounds ahead of everyone else in the game. The level of detail in Monsters University is so lifelike that at times I thought it was real footage I was looking at. The Pixar short before the feature film was equally as amazing. I was near convinced that what I was seeing was actual footage, shot with a camera, of New York in the rain. The fact that it was animated blew (and still blows) my mind. But Pixar doesn’t stop there, it’s not just their animation that’s amazing. Their stories are incredible as well, as is the case with Monsters University. We already know these characters and we love them. But this story lets us get to know them all over again in a new way. 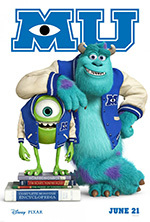 We get to flash back to Mike as a child and learn why he wants to be a scarer and how he ends up at MU. We learn that Sully’s family is famous for being scarers. We learn so much yet it’s not forced down our throats, it’s not presented to us in a way that feels uncomfortable or awkward. It’s been a while since I’ve been to a movie that there was applause at the end. But there was a good round of applause not only at the end of Monsters University but at a number of points throughout the film as well. Without giving anything away, there’s a number of scenes where you’re rooting so hard for the “good guys” that you find yourself smiling and cheering when they come out on top. I found myself having so much fun that I didn’t want it to end. I wanted to keep following Mike and Sully after the movie ended. Moments before the movie ended I found myself leaning over to my movie companion and saying “We should watch Monsters, Inc after this!” I wanted to pick up right where Monsters University leaves off, which is right around the beginning of Monsters, Inc. A very well tied together pair of films and Pixar pulled it off quite well. I’m 100% glad I disregarded the reviews I read about this film and went to see it anyway. I laughed, I teared up a bit, I clapped a lot, and I overall had a wonderful time. I couldn’t have expected anything more and Pixar couldn’t have given me anything more. Monsters University is as close to perfect as they could have gotten it. We here at MovieSnobs are big fans of John Cusack (let’s be honest – who isn’t?). Needless to say, when we heard he was doing another animated feature, we were thrilled. Igor tells the story of an Igor (which in this context is synonymous with “scientist assistant” who doesn’t want to be an Igor anymore. He wants to invent something and win the science fair on his own. The trailer is available on Yahoo Movies, and it’s absolutely brilliant. From the use of “She Blinded Me With Science” to the voicework of Cusack, Steve Buscemi, Eddie Izzard, and Sean Hayes, among other all-stars, the trailer is wonderful. The movie will be out September 19th. I highly recommend checking out the trailer.